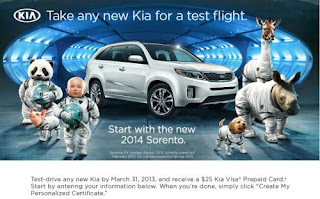 Test drive a new Kia by March 31, 2012 and receive a $25 Kia Visa® Prepaid Card. This offer is good from January 30, 2013 through to March 31, 2013. To be eligible, test-driver must be 18 years of age or older with a valid driver's license. This offer is non-negotiable and non-transferable. One (1) $25 Kia Visa® Prepaid Card per person. Click the link below to go to their website for more information & to get all the details.